Li has garnered much attention by tackling complex reforms over the past five years, during which time China has faced multiple challenges, including the deadly Wenchuan earthquake and the international financial crisis. Macroeconomic adjustment was the first challenge the vice premier had to face in 2008. When there was no agreement on a proper way to manage the repercussions of the international financial crisis, Li asked the State Council's fiscal and economic planning departments to adopt a proactive fiscal policy with the precondition of keeping the deficit below 3 percent. The decision gave the Chinese economy a boost that was strong enough to avoid complications such as the sovereign debt crisis in Europe and the "fiscal cliff" in the United States. Li also chaired more than 40 meetings to deliberate on and make arrangements for an affordable housing program for the needy, which is the biggest of its kind in China and has helped boost domestic consumption amid a slowing world economy. Over the past few years, China's fiscal spending on affordable housing construction has reached a record high. With 17 million government-subsidized apartments already built, nearly 100 million Chinese have moved into comfortable, high-quality homes, and another 13 million apartments are currently under construction or being renovated. Another reform that has thrust Li into a widening spotlight relates to medical and health care services, a worldwide challenge. After Li took over as head of the State Council's leading group for medical and health care reform, the country quickly set a goal of turning medical and health care into a basic public service accessible to all, taking a progressive approach to prioritizing the basic needs of the people and the need for institutional improvement. The central government has issued 14 documents to inspire local experiments since 2009. All relevant tasks are being implemented efficiently. Under this regimen, the government has built the world's largest medical care system in more than three years, effectively easing public concern in this area. U.S. scholar Robert Lawrence Kuhn said he considers this reform to be the greatest achievement China has scored in the past decade. Margaret Chan, director-general of the World Health Organization, has called the achievement hard-won. John Langenbrunner, the World Bank's chief health economist, described the results achieved by the reforms as unprecedented. Li was also credited with seizing the opportunity presented by the 2008 financial crisis to propel complex fuel tax reforms involving multiple stakeholders. The initiative has helped eliminate redundant fuel fees, inspired energy conservation and emission reduction, improved the refined oil pricing system and accumulated experience for future reforms. This year, Li went to great lengths to tackle another bottleneck in tax reform. He conducted field surveys and led relevant departments to institute reform plans that replace turnover taxes with value-added taxes. After Shanghai spearheaded a pilot program, the tax burdens of the local service industry and small enterprises have been largely eased. A prelude to the much-expected structural tax cut, the pilot program has now been expanded to nine provinces and municipalities as a significant institutional innovation for facilitating economic restructuring, boosting economic growth and improving people's living standards. Li also led the formulation of China's 12th Five-Year Plan (2011-2015), which provides both overall guidance for the country's future development and specific guidance in nearly 100 areas. Although Li was familiar with China's agricultural and industrial development as head of Henan and Liaoning provinces, he has gained a broader understanding of China's national circumstances after being put in charge of development and reform, fiscal affairs, urban-rural construction, environmental protection, land and resources and public health for the State Council. He knows China's potential in economic and social development as well as the opportunities and challenges the country is facing. To formulate a sound plan, Li conducted field surveys in a number of places and governmental departments, solicited opinions from lower-level officials, industrial experts and entrepreneurs and presided over symposiums to brainstorm plans concerning the tertiary and energy industries. In-depth research was carried out for more than two years on significant issues, such as expanding domestic consumption in a sustainable manner, narrowing the urban-rural gap, designing an urbanization path and steadily improving people's living standards. U.S. economist Michael Spence, a Nobel laureate, said the 12th Five-Year Plan is very complicated but clear. Its effective implementation will turn China into the most significant player in transforming economic growth patterns and rebalancing the world economy, he noted. Joseph Stiglitz, also a Nobel laureate, said the development plan charts the direction of China's economic restructuring, with China's central task being to open up and better integrate with the outside world. New responsibilities and opportunities will abound and the country will be more involved in reshaping the world economic order, he said. Martin Feldstein, a professor of economics at Harvard University, noted the plan's important implications for the global economy. "Its key feature is to shift official policy from maximizing GDP growth toward raising consumption and average workers' standard of living," he noted. Known as a tough troubleshooter, Li has regularly appeared where he has been needed most. 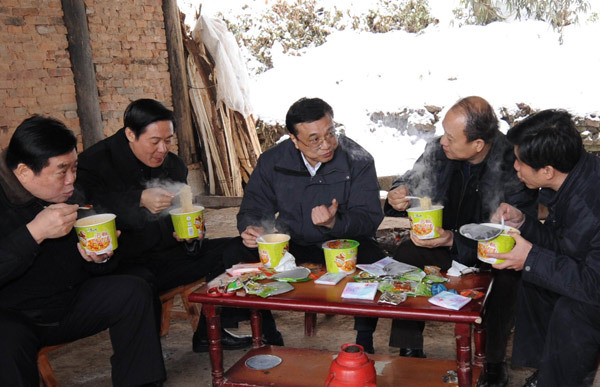 When food safety scares cropped up in 2010, Li was asked to head the State Council's food safety commission, orchestrating multisector cooperation. "Food safety concerns every family and each person. Giving food safety offenders a knock-out blow is a must," Li stressed. By including food safety in the performance assessment system for local governments, as well as cracking down on offenders, China has begun to see progress in curbing food safety scandals. In early 2009, the world was caught off-guard by a new influenza A virus, with the World Health Organization issuing its highest influenza pandemic alert. Not long after its outbreak in North America, the virus was transmitted to China, throwing the Chinese into a panic reminiscent of the Severe Acute Respiratory Syndrome (SARS) epidemic in 2003. Li decisively implemented joint prevention by all relevant departments and urged the quick development of vaccines, which stopped the spread of the virus and minimized its impact on China. This triumph has been lauded as an exemplary emergency response to a sudden public health incident. As China's current reforms involve a more complicated problem of interests, analysts say knowledge and a broad horizon are as important in Chinese leaders as courage and resources. His toughness in advancing complex reforms, as well as his social warmth and scholarly temperament have made him a major figure in China's political arena.